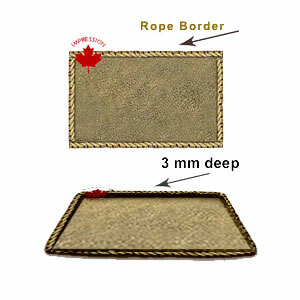 Blank Rectangle Belt Buckles, with a rope border so that you can design your own buckles are flat. The rope border edge is raised with a 3mm interior depth. These attractive and durable base metal belt buckles are an excellent product to be able to personally create a belt buckle using your own design and artwork. The buckles are available in an Oval, Round or a Rectangular shape, and can be finished in most platings. Other sizes and shapes are available by purchasing a new mold. Note: The rope on the edge of this buckle has been produced for another customer and if you wish, this item can be manufactured without the rope edge. The face of the buckle is textured to facilitate enhancement. 2" h x 3" w Oval $19.50 $15.00 $12.50 $9.95 each. 3" h x 4" w Oval $29.75 $25.56 $19.95 $18.65 each. We need 28 working days to process your request. If you has approved your final artwork and paper work has been completed today(Apr 19, 2019), the estimated shipping date will be: May 28, 2019. The back of each buckle can have your same common design (such as your Website address) for an additional setup cost of $125.00. If individual personalization is required (such as a different person's name or number per buckle), the cost would be $8.50 per buckle, subject to a review of what you require. The belt buckles that we manufacture will accommodates belts 1 1/2" to 1 3/4" wide. Our firm is a manufacturer of custom belt buckles using production-ready artwork supplied by our customers. If you wish to have only one custom belt buckle manufactured for you, the minimum invoice charge is approximately $450.00 for a standard 2-D belt buckle in the size of 3" wide x 2" high. This includes your custom casting mold with our standard 4 week shipping. Your actual cost will depend on the size of buckle you require and the details in your design. If you wish to order a quantity of belt buckles that is less than our 30-piece minimum, there will be a $150.00 handling charge or a $450.00 minimum invoice cost. Each belt buckle is individually packaged in its own gift box that will serve to enhance presentation and to protect the buckle during shipping. ·	You complete, sign and fax our Artwork Order Form. If possible, supply your own production-ready artwork (preferred). This way you can spend as much time as you like creating the perfect look that is best for your chosen project. Please allow five (5) working days for our artists to create a virtual proof of the product you require. After we receive your signed artwork approval by fax, we will send you a Sales Confirmation. Only after we receive your signed Sales Confirmation by fax, we will start producing your order. The standard thickness of our buckle is 3 mm; thicker sizes are available at an extra cost due to the extra metal required to mold your custom design belt buckles.